A second self-taxing community improvement district has sprung up in DeKalb County. The new Stone Mountain CID was approved by the county commission last week and has elected its first board of directors. The new CID’s members elected developer Emory Morsberger the district’s president, and Larry Callahan, CEO of Pattillo Industrial Real Estate, was chosen to serve as chairman. Stone Mountain becomes the 14th CID in the metro region, all formed by commercial property owners who agree to pay a tax to finance improvements inside their districts. The Stone Mountain CID is bordered roughly by Hugh Howell Road, East Ponce de Leon Avenue and Tucker Industrial Road. Other major roads running through the district include U.S. 78, also known as Stone Mountain Freeway, and Mountain Industrial Boulevard. 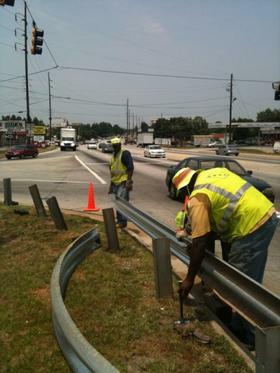 The new CID already has completed its first project, repairing and replacing guardrails along Mountain Industrial. The county’s first CID, located in the portion of the Perimeter area inside DeKalb, has brought in more than $100 million in grants since its formation in 1989. Shop for a cause at Whole Foods Market Briarcliff! On Wednesday, June 30, Whole Foods Market will donate 5% of their net sales to the Lindbergh LaVista Corridor Coalition. Funds will be used for the continual development of the Confluence Trail system along the North and South forks of Peachtree Creek. Stop by the Briarcliff location to show your support and help raise important funds for the LLCC! The City of Atlanta hopes the federal government will give its streetcar plan a green light during the second round of TIGER (Transportation Investment Generating Economic Recovery) grants. City leaders are presenting their revised streetcar proposal to the Atlanta City Council this week and need the full council’s approval before July 16 when pre-applications are to be submitted to the U.S. Department of Transportation. Atlanta and Georgia did not fare well during the first round of TIGER grants — when $1.5 billion were distributed to transportation projects across the nation. In the first round, the federal government was offering 100 percent of the funding. In an effort to burnish their image with consumers, several Fortune 500 companies have launched online giving contests and invited customers to help them determine which nonprofits should receive their charitable dollars, the Bergen Record reports. Companies that have rolled out such campaigns include Target, Pepsi, Northwestern Mutual, and Sam’s Club, which recently wrapped up its Giving Made Simple campaign in which Sam’s Club members and employees were given an opportunity to help decide how $4 million should be allocated among eight charities. The Obama administration has taken note of the phenomenon. With help from the Case Foundation, the administration held a conference last month to discuss ways for businesses, foundations, and charities to use prizes and challenge competitions to spur new ideas and innovation in the nonprofit world.